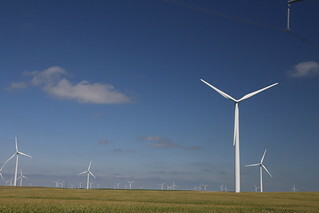 South Dakota, yet another vast expanse of corn farms and wind fields punctuated momentarily by the odd town highlighting for miles on various billboards their only draw worth featuring. 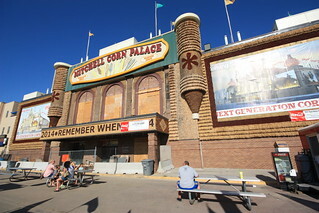 One of these places was the enclave of Mitchell, home of the ‘Corn Palace’, a local building decorated yearly with murals made of, you guessed it, corn. The theme for 2014 was ‘Remember When’ and whilst all of the murals weren’t completed you could see the artistic talent that goes into it. 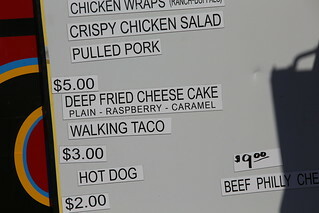 Mitchell was in the midst of holding its annual harvest street fair and whilst an appealing gathering for the surrounding population, the only noteworthy experience for us was bumping into a gentleman by the name of John Alveres. 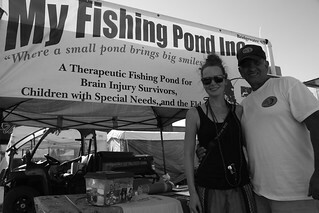 John runs ‘My Fishing Pond’ for people in the process of rehabilitation from a major brain injury or with brain related conditions. Being both an inspiration and sufferer of such an injury in an unfortunate accident, he has begun to receive recognition for the effort he is affording to help others whom have experienced a similar event. Being proud to meet John, you can find details of his generosity here. Filling up again at a wallet pleasing $3.20 gallon (50p litre WTF!) Betty took us along the I-90 deeper into South Dakota. Witnessing another far off thunderstorm whilst the sun was packing up for the night, we watched in awe as the ominous sky was lit momentarily with flashes of the orange spectrum, illuminating the foreseeable horizon. Due to Betty’s previous leaks we hastily pulled up for the night in an indescribable rest stop rather than tackle the storm. Waking to another long drive across the I-90, our dreams of a cruisey day on the road were shattered early when we noticed the radiator hose we’d previously doctored with duct tape was starting to fade (after an impressive 1,500 miles). Pulling into small town Belvedere we were directed to the next smaller town of Kadoka where a mechanic was on hand. In his 70’s, he did not understand one word of Matt’s English, and when asking what year the van was he actually asked Sarah ‘Do you speak better English than him?’. Laughing but not wanting to risk the same reaction, she wrote ‘1980’ on the back of her hand, and we were eventually given the good news that the local warehouse happened to have the part we needed and off he went in his old pickup truck to collect it for us (what are the odds in the middle of small town nowhere??). With Matt replacing the hose, we got back on the I-90, passing one of over 100+ ‘Wall Drug’ billboards. If you happen to pass this way, you’ll be lucky enough to see these for over 100 miles, without actually figuring out what the hell ‘Wall Drug’ even is, as we didn’t either. Just off the I-90, if you’ve done the smart thing and bought your annual US National Parks pass (if you haven’t don’t worry, you can buy it here), you’ll bypass the $15 entry fee and drive right into Badlands National Park. This place is the first real out of this world landscape you’ll see since leaving NYC if you follow the same route we did. Home to 600 Bison reintroduced in 1963 (they’re actually native but were wiped out out of here by 1880), you’ll also pass a cute as hell prairie dog patch where you’ll see so many prairie dogs prancing, posing and squeaking it might just make even the toughest guy go ooohh. Continuing on the 240 scenic loop, we hit the I-90 again and headed for the Minuteman Missile silo. It’s interesting to note how much of the US population had no idea their government had men spread across this part of the country aiming nuclear missiles at the Soviet Union…but they did, and there were loads, this is just one of them and it’s open to the public. Thing is, it’s not very well signed…and why would it be! The Visitor Centre is on your right just as you take exit 131 from the I-90 onto the 240, but the actual silo where the missiles were held and the guys sat with their finger on the button is right by exit 127. For this you need a tour ticket from the info centre at exit 131. We couldn’t find this information anywhere until we’d come back to the visitor centre and wasted so many kilometres, and so much time, that we gave up in frustration. Don’t make the same mistake! Details for those who are keen (from what we’ve managed to find online as you can’t find this info on the National Parks website) – get there early (the 131 exit) and book a free tour. It’s first come first served with only six people allowed at a time. Although it’s hard to find this info, it’s worth noting that if you search for ‘Minuteman Missile silo’ in Google the top ‘People also search for’ suggestion is Wall Drug store. Guess nobody else knows what it is either! 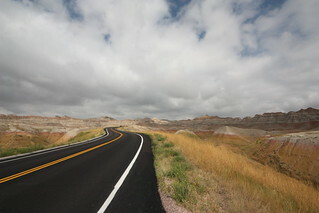 The scenic 240 through Badlands National Park, watch out for the prairie dogs! Opting to take the 44 back road rather than the I-90 interstate we cruised along – didn’t see any bison but did site a random big green dinosaur in a paddock at one point (do they call it a paddock in America?). 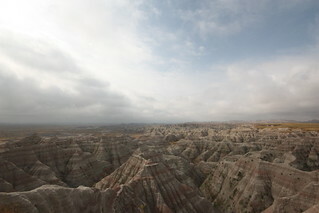 Finally hitting the famous Black Hills of South Dakota, well noted by Sarah from ‘Calamity Jane’ fame. This became the beginning of numerous infamous events where Betty would let us down. Rushing our way to Mount Rushmore Betty decided to slow us down in, of all places when you’re in a hurry, Rapid City. Coming to the initial stages of what would become a heart thumping journey down a hill she decided that enough was enough and promptly took to conking out at the first stop light . Unable to kickstart Betty’s heart back into V8 growling glory, Matt was again under the hood. Within 2 minutes of having the bonnet popped a big burly bloke named Dave pulled up behind with his father in tow. 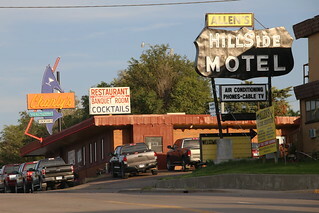 This story becomes the first in a line of hospitable takings in of the famous Mid Western culture. Dave, known as big Dave to his friends, was the best part of 350 pounds and most likely an ADHD candidate. Nice guy by the way. He was so kind to give us a tow down what he perceived as a 1 mile road into town to his mechanic. This quickly descended into a white knuckle, harrowing, steep five mile downhill tow to his trusted local Goodyear Auto shop. The only pleasure taken was the fact that Dave was a, to understate it, massive Keith Urban fan, realised by the many belted out renditions of his back catalogue, and the many references to Matt’s similarities with good old Keith. Two good looking blokes I guess. Having had Betty in the shop and on the computer diagnostic, whilst we sat at the local nursing an aptly named ‘Smokin’ Betty’ porter at the local Firehouse Brewery, we were brought abruptly to the gloomy realisation that she was now running on 6 instead of 8 cylinders. The guys there were accommodating enough to push the van outside the roller doors so that we could come home drunk after drowning out the stresses in the renovated fire station come brewery, followed by an impromptu city park Karaoke session with some out of tune local kids (so bad that tone deaf Matt had to get up and help them, anyone’s who’s heard him sing will sympathise). Waking in the morning to the unknown condition of our Betty, and whether we’d be outta there any time soon, we avoided the prognosis deciding to take breakfast at the highly recommended local Tally’s Silver Spoon cafe (apparently the Duck, duck, goose breakfast is to die for, if you can stomach the foie gras). Hunger suppressed and wired on the constant refills of coffee, we sheepishly made our way back to the mechanics for the verdict. Yes Betty was up and running, yes minus two cylinders, but grasping to hope we were told that maybe yes she’d make it to Vancouver where we had a friend’s mechanic to hopefully help sort the bigger issue. Stay tuned for the advancing mechanical melodies.